The majority of SA renters are living in substandard rental properties and are afraid to raise repair issues with their landlords, a new report has found, prompting the state’s peak housing group to call for the establishment of a government-funded tenants’ union. 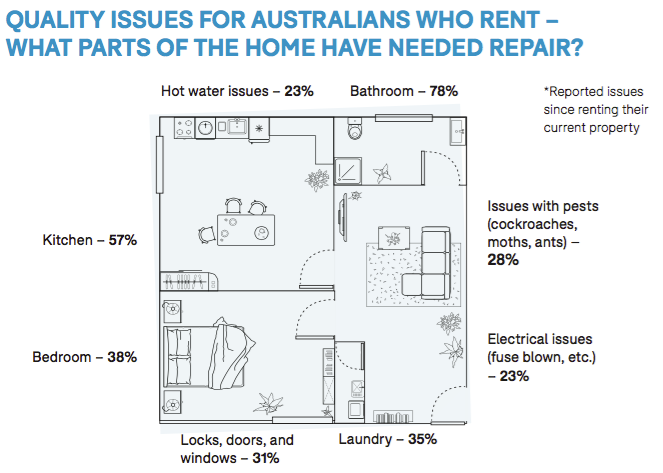 A survey conducted by National Shelter, the National Association of Tenant Organisations and consumer group Choice of more than 1500 Australian renters found that of the South Australian respondents, 51 per cent were living in houses that needed repairs. South Australia matched the national average for renters living in substandard homes, coming in third behind New South Wales and Victoria. The findings, published in Choice’s Disrupted: The Consumer Experience of Renting in Australia report, also found 68 per cent of Australian renters said they were concerned that notifying their landlord of property damages would result in a rent increase. The majority of renters also reported feeling concerned that house repairs would be delayed by an unreasonable length of time or that requests for repairs would be ignored indefinitely. Shelter SA executive director Alice Clark said it was “worrying” that the report showed South Australia was “just as bad as the rest of the country” when it came to substandard rental properties. She said it was unfortunate that there were no protections in South Australian law to allow people in the private rental market to take action against their landlords if property damage issues were not adequately addressed. “I worry that because of increasing land value and house prices in South Australia, we are seeing some landlords who are not very willing to attend to repairs and are taking retaliatory action against their tenants if they do ask for them – either through a rent increase or an eviction,” she said. “I heard recently from a private renter who was living in a property where the electrical wiring was ‘unearthed’, as she called it, and when she asked for that to be remedied it went on for several months. According to the Choice report, rental property damages are most likely to be located in the kitchen (57 per cent) and the bathroom (38 per cent). The report found one-third of Australians who rent have experienced problems with mould in their bathroom, with a further 28 per cent reporting issues with pests (cockroaches, moths and ants) and 23 per cent reporting electrical issues. Clark said the report’s findings highlighted the need for a government-funded tenants’ union for South Australian renters, in particular, the 46 per cent who said they would find it difficult to afford a 10 per cent increase in rent. “Every state and territory in Australia has a dedicated tenant union except South Australia – we are lagging behind and must do more to protect renters and their rights,” she said. “What tenant unions do interstate is they have the community legal centres with lawyers that can give individuals legal advice and they can do to hearings with tenants and really just make sure they feel they’re as informed as they need to be if they feel they’ve received unfair treatment. Human Services Minister Michelle Lensink did not respond to InDaily’s question asking whether she supported the call for a government-funded tenants’ union, but she said the Government had “hit the reset button” on what she described as a “broken” housing system. “The State Government is currently seeking input from service providers and key community and industry stakeholders about how to best plan for South Australia’s future housing needs,” she said. Lensink last week announced the State Government would form an industry task force to develop a new housing and homelessness strategy for South Australia. The strategy will seek to improve crisis homelessness services, social housing, affordable housing and the general housing market. Clark welcomed the task force, saying it would ensure that “all sectors of housing” could collaborate to improve housing outcomes in SA. “To me, the governance settings are coming together really well,” she said.